The first two weeks of the new year have not been very kind to the global markets. Aside from a few FX plays I haven't traded much stock or commodities this year for that matter due to high volatility in the current financial markets. What a mess! The great sell-off which was caused mainly by low oil prices, and investors spooked by crashing markets in China, seemed never-ending. The age old question now once again is: has the bottom been reached? Can we confidentially assume that stocks are indeed on sale right now, and can we finally add some great bargains to our portfolio? Of course no one can be 100% certain that this plays out well, but I am pretty optimistic, regardless of oil. I think we may have come to a turning point regarding the American markets. 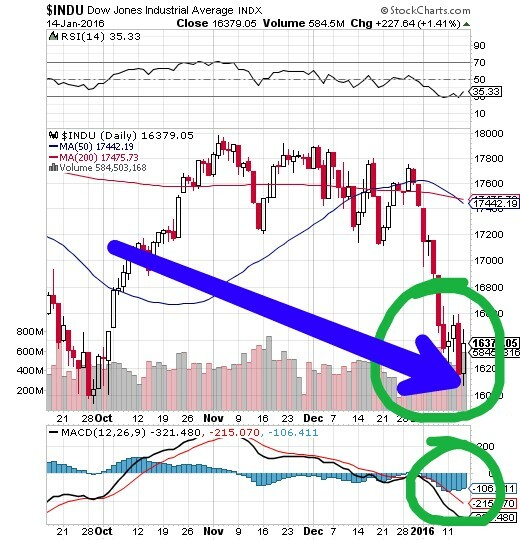 The blue arrow indicates there are buyers in this market, the last few times a candle arose like this, a bull market followed - not a long one, but at least there was one. Looking at the charts I see big opportunities lying ahead. 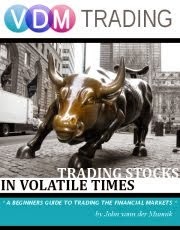 I don’t want to delve into specifics when it comes to stocks (still doing research, I’ll post my picks on twitter as soon as I have my list ready), but already the Dow and the oil trade are on my trading list. Both of them are pretty simple trades, with the Dow regaining the losses of the beginning of the week and when it comes to the oil trade; $30 is basically the psychological price point. One of the reasons why it has been hovering around there. If it crashes any further, I think below $29 is a pretty good trigger, we can fairly assume that the downward trend will continue, if above $31 next week it could signal an uptrend. Either way, it will cause a domino effect in the financial markets. 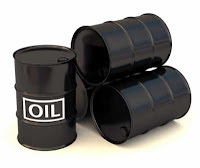 As for now I am a seller of oil, mainly due to the oversupply. When it comes to the Dow, I’m looking for a good entry point. I’m keeping a close eye on both CFD trades.